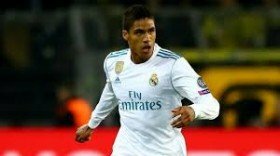 Real Madrid star Raphael Varane has dismissed the ongoing speculation linking with Manchester United by expressing his happiness playing for the Bernabeu outfit. The France international has been heavily linked with a move to United in the past few days with reports indicating that he could prefer a fresh challenge during the prime of his career. However, speaking after Les Bleus' 4-1 win over Moldova in an European qualifier, Varane stressed that he has no reason to leave the Champions League holders in the near future. "To say that I am not happy at Real Madrid is not true. I'm at Real Madrid, The biggest club in the world. I'm constantly in a state of challenging myself because the requirement here is that of the highest level," he told ESPN. Varane has racked 268 appearances for Real Madrid in all competitions since making the switch from Lens eight years ago. He has won four Champions League crowns, one Copa del Rey and one La Liga title in this period.